Billy Doody was a loving husband, brother, son, uncle, and a wonderful friend to all who knew him. Active throughout his life, he made the most of each and every moment. He modeled a lifetime of showing compassion towards others and his wonderful collection of memories and natural sense of humor will remain dear to his special family and friends forevermore. Billy’s story begins in the year 1940. The effects of the Great Depression were finally beginning to ease, yet there was tension in Europe when Germany invaded France. The feel-good feeling of leaving the depression led to the release of major motion pictures such as, "Gone With the Wind." Jazz music boomed with the likes of Benny Goodman and Count Basie. William P. and Barbara (VanHoven) Doody welcomed home their youngest son, William Patrick on September 7th in Grand Rapids, Michigan. His birth brought much happiness into their loving home. Billy was born to a set of hardworking parents. His father was a millwright and his mother was a homemaker. Billy was immensely proud of his Irish heritage and savored celebrations special traditions over the years including St. Patrick’s Day. Born the youngest in a family of seven siblings, there was never a dull moment in the Doody household. He and his siblings had their fair share of mischief. As a young child, Billy owned a model train set that his father had gifted him and he spent countless hours enjoying changing its route and as a result fell in love with model railroading. When he wasn’t immersed in his trains, he was outdoors playing baseball with the neighborhood kids. Billy completed high school at Creston through his eleventh year and left before his senior year to seek gainful employment at Haven Busch as a welder. When he grew tired of those years, he landed a job as a specialty paint sprayer for Steelcase where he proudly remained for thirty remarkable years until he retired. Meeting Norma “Dodi” Wiles at Tom’s bar on Plainfield Avenue changed the course of his life forever! For them, it was love at first sight and from that night on they began dating. Eager to settle down the happy couple joined in marriage before the justice of the peace. Later, they decided to have their marriage blessed at St. Jude Catholic Church. Settling down at 2471 Knapp Street NE they made their forever home. Content and happy, they enjoyed sharing many commonalities including traveling, spending time outdoors, as well as gardening. Billy and Dodi both enjoyed canning and freezing the fruits of their labor at fall harvest time. When he and Dodi had the chance they never passed up an opportunity to head to their cabin in Irons, MI or their many trips to Michigan’s beautiful Upper Peninsula. Nothing brought them greater peace than being connected to the nature around them. A trip of a lifetime was when they both toured the country of Ireland. Billy was thrilled to visit the historical sites as well as the local taverns and experience his heritage. They shared a wonderful marriage and there was no greater testimony of his love for Dodi than the time he spent caring for her before she passed from lung cancer in 1991. The loss affected him immensely, yet he leaned on his supportive family and friends to see him through. Never one to remain idle, Billy enjoyed many favorite pastimes over the years. He bowled on a league at the Lincoln Country Club as well as played softball on the Steelcase team. When he wasn’t on a walleye fishing trip to Canada with his good buddy, Tony Yowish or smelt dipping on the Black River with family and friends, he loved to follow his favorite team the Detroit Tigers on the television or radio and even made a few trips to see them play at home. Billy was also an avid coin collector of Proof Sets which were the rarest and mint coins. 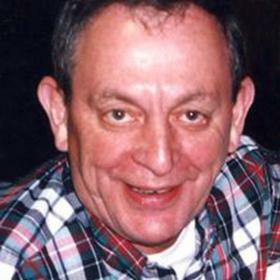 Although he favored listening to country western music, he was also known to enjoy classic Irish music. A man of simple means, he was content with his favorite comfort foods of mashed potatoes, popcorn, and potato chips and he never passed up a good hamburger and a fresh, cold beer! As his health declined due to side effects from his diabetes, he spent a year in Sanctuary of St. Mary’s. Later, he moved to Villa Elizabeth Apartments before his last four years at Heron Manor Assisted Living where he received the most excellent care from the loving and dedicated staff. Described as hard-working, honest, and a lover of the great outdoors, Billy will be deeply missed and lovingly remembered by all who knew and loved him.